Pompeii - Sorrento - Positano . Pompeii, Sorrento e Positano. Herculaneum Gate, called Porta Salinensis - "Salt Gate"
A great tour combining an overview of the spectacular Amalfi Coast and its colourful resorts with Pompei - the world most important archaeological site - and Sorrento, the land of the sirens. 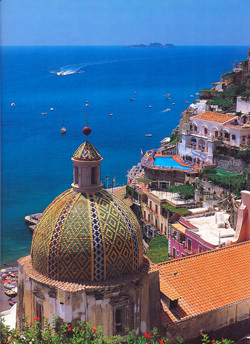 Using private limited capacity vehicles gives the opportunity to reach Positano where tour buses are not permitted and the possibility to see in the same day the most important highlights of the Bay of Naples. Heading south along a coastal highway passing smoke capped Vesuvius drive to ancient Pompei. In this ancient playground devastated by Vesuvius eruption when 30 feet of volcanic ashes and pumice stones covered the city time was somewhat preserved and present day visitors experience life as it was lived in 79 AD. A short walk leads to the Forum surrounded by imposing temples and porticos. 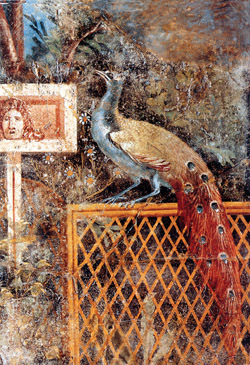 Gorgeous residences of wealthy patricians, beautifully preserved wall paintings and inscriptions. See the raised pavements on both sides of streets and stepping stones ensuring safe crossing at intersections. 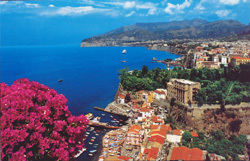 Next stop is romantic Sorrento, perched on cliffs towering straight out of the sea. From Sorrento enjoy stunning views of the Bay of Naples. Stroll around the main square and colourful back streets lined with shops showing beautiful inlaid wood articles, a local specialty. On along the Amalfi coast to Positano, a live picture postcard with vine-covered stairways and back streets tumbling down to the beach dotted with brightly coloured fishing boats. 1-hour time to explore this elegant art colony resort with its designer boutiques and waterfront cafés. Then back to the cruiseship. 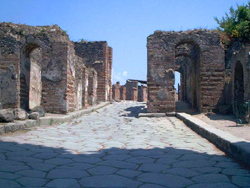 THE PRICE OF THIS PRIVATE TOUR TO POMPEII-SORRENTO-POSITANO IS OF € 250.